Cost to install a whole house fan varies greatly by region (and even by zip code). Get free estimates from air-conditioning and heating contractors in your city. Cost to install a whole house fan varies greatly by region (and even by zip code). The cost of installing a whole house fan is between $1,250 - $1,830. A whole house fan is a system that draws air through the house, pushing it into the attic. 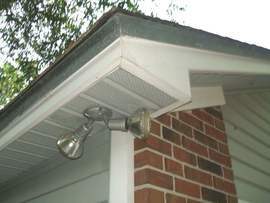 This creates positive pressure, which sends the hot air out through the gables, roof, or soffit 1 vents. At the same time, a negative pressure is created in the house, drawing in cooler air through open windows, and cooling the temperature indoors. Some of the benefits of installing one go from making the aire less dry than air conditioning units, lower energy bills, to a more comfortable home. Whole house fans are best used in the early morning or late evening when the outdoor air is cooler, preferably below 70 degrees. The whole system works by pulling air in through open windows, so it is important to shut your air conditioning off during this time. By not using the air conditioning continually through the day you can save on energy costs, because the whole house fan will use only 200-700 watts compared to 2000-5000 watts used by an air conditioner. There are many factors that can affect the cost of a whole house fan installation. The size of the home, the number of vents you may need installed, and the efficiency of the unit you purchase can all have an effect on the total cost. The average cost for a whole house fan ranges in price from $1250-$1830 including labor, materials, and the fan itself. Attic fans circulate air in the attic space, keeping the attic from getting into superheated conditions, while removing humidity from the attic. However, the attic fan does not cool the entire house; it only affects the attic. A whole house fan, however, does cool the entire home by pulling cooler air in, while pushing the hot air out. Belt driven fans have a belt that runs directly from the motor to the blades, turning them. They are typically easier to install, maintain, and are quieter. With a belt driven system you can also use larger blades which spin slower and offer a quieter operation. Another benefit of the belt driven fan is its standard motor, which is easily repaired or replaced if there is an issue. The belt driven fans range in price from $235-$320. Direct driven fans have the blades attached directly to the motor. Because of the design, the blades are smaller, flatter, and need to spin faster which creates more noise. The direct driven fan has a motor, which is mounted in such a way that it is difficult, if not impossible to repair or replace. The direct drive fans range in price from $530-$1850. Ceiling mounted fans ($235-$1,850) are installed between the attic and the living space. These are the most popular and inexpensive to install, and can move large volumes of air quickly. Ducted fans ($530-$1,020) are actually installed in the attic, away from the ceiling line. A duct is used to transport the air, which makes for a quieter operation because the fan itself is not attached to the floor joists. Most whole house fans offer at least two speeds, costing between $600-$1850. There are several models, which offer variable speeds, as much as 5 or 6, costing up to $1,700. Some variable speed fans also allow for control through your smart phone for an additional $240. In addition, there are also models with thermostats 2; you set the temp and they run according to your settings. 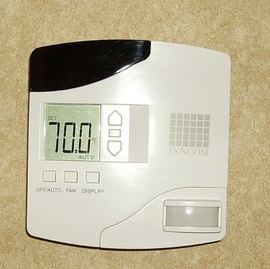 Average thermostats 2 run from $25-$60 for a traditional style or $200-$300 for a smart touchpad style. The recognized standard for sizing a house for a whole house fan calls for the air to be turned over once every 2-3 minutes. The calculation is simple: multiply the total square footage by 2. A standard-sized house is 2,400 sq.ft., therefore, 2,400x2=4,800 CFM (cubic feet per minute); the capacity the whole house fan would need to cool this house. In addition to the fan itself, you will also need attic venting to ensure proper air flow. To calculate this, you will take the number of CFM and divide by 750. In the example above, this home would need venting of 6.4 sq.ft. The ideal location for your whole house fan is in a center hallway where there are no obstructions such as vents, wiring, or plumbing. This installation will most likely call for a joist to be cut so it will fit, and for some wiring to be done. The average cost of an electrician is $65-$85 per hour, while the average cost of a carpenter is $70 per hour. There is also the option to hire a handyman who could do both carpentry and electrical for $60-$90 per hour. Overall the typical installation should take about 8-12 hours. Using the handyman rates, the installation (labor only) would range in price from $480-$1,080. This would cover either the ceiling mounted or ducted fan. Although the installations may be different, the time and labor would be similar. Fan covers range in price from $30-$85. The covers typically goes over the shutters on the interior of the house and will help keep the cold air out of the attic during the winter months. Insulated doors will add even more protection than a fan cover. 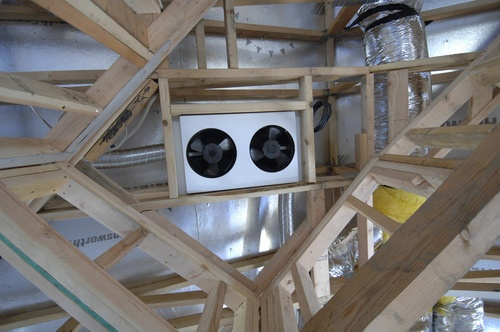 Many whole house fan models come with insulated doors that are on the attic side and attached to the fan system. They close over the fan to insulate from the attic side. The cost is reflected in the price of the fan. Fans with insulated doors cost between $580 and $860 more. Timers are very handy because you can set the time you want your system to run and they will then automatically turn off at the set time. Timers range in price from $10-$35. If your attic doesn't have proper ventilation, you will need to install some vents to allow the air to flow through. Vents cost between $20 to $40 a piece. Windows must be open when using a whole house fan. Remember the system works by pulling the warm stale air into the attic and drawing the cool, fresh outdoor air into the house through open windows and doors. If you do not open your windows, there is a danger of backdrafting or pulling the flames out from pilot lights of gas appliances and furnaces causing a carbon dioxide build up in your home. Do not light a fire in the fireplace while using a whole house fan, as the flames could get sucked into the room as well. While using the whole house fan, do not use the air conditioner or furnace. This would be defeating the purpose as you would use more energy; the air conditioner requires to have the windows to be closed, while the house fan requires them open. Certain regions may require permits to install your whole house fan. Check with your local government to see what the requirements are. If you have your system installed by a professional, they may be able to assist you with the permit application as well. Mold can be a problem in humid regions where humid air condenses on surfaces which can eventually form mold. It is important that your basement area is free of mold and dust to prevent it from circulating through your home. The cost to install a whole house fan ranges between $1,250 and $1,830 depending on the size and type of fan. A whole house attic fan creates positive pressure in the house by pulling fresh air in and pushing the old, hot, humid air out. How much does it cost to put in an attic fan? An attic fan costs around $300 to have installed. What is the point of an attic fan? Attic fans keep the attic cool year-round by removing the superheated air and replacing it with cooler, fresh outdoor air. This prevents damage to the roof, while preventing the superheated air from returning to the living areas downstairs. Yes, attic fans are very effective at keeping the attic cool, which in turn helps prevent issues like ice dams and heat damage to roofing shingles. A whole house fan circulates the air through the whole home by creating positive pressure in the attic and pulling in fresh air from outdoors. This helps lower the temperature and humidity of the interior of the home. How much does it cost to install a whole house fan in my city? Cost to install a whole house fan varies greatly by region (and even by zip code). To get free estimates from local contractors, please indicate yours. We have also added an image of the project, in this case of a part of whole house fan system, to help the user better understand the project.